PTFE (Teflon) coated glass cloth has become established as the highest quality architectural membrane for tensile structures. The material was developed by DuPont in the 1960s and has been used for structures since the early 1970s. 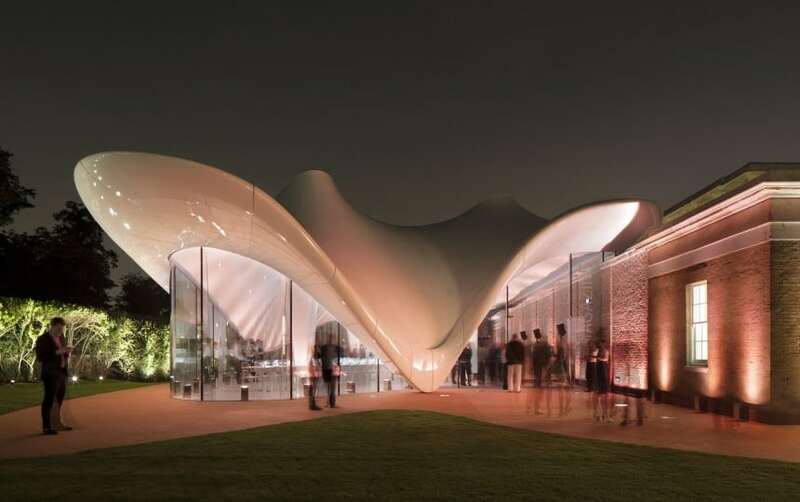 The original 25 year design lifespan of the material has already been exceeded by the earliest structures, and present day expectations are for 30-50 year lifespans. PVC coated polyester had been used as an economical alternative to PTFE cloth, typically achieving savings of 50-70 per m2 on construction costs. The lifespan of PVC coated polyester is typically 15-20 years. The insulative properties of PTFE coated glass is similar to the performance of conventional glazing. The equates to a U value of aprox 4.0 5.0 for a single layer membrane, and 2 2.5 for a twin layered membrane. Twin layered membranes have a light transmission level of approximately 50% of a single skin structure. The typical characteristics of single skin tensile fabric roofs to sunlight are approximately 75% reflection, 10% absorption and 15% transmission. All Teflon coated glass cloths are inherently non-flammable and achieve Class 1 in surface spread of flame testing and class 0 performance in BS476 pt6 Fire Propagation tests. PTFE is actively bleached by UV light, which had the effect of maintaining a bright white appearance in the long term. The Teflon coating provides a chemically inert layer which resists the build up of environmental pollution. The material had been extensively tested both in the laboratory and out in the field and no degradation or loss of strength is observed. The material does not become brittle or discolour over time. It is anticipated that the material has a life in excess of 30 years. As lightweight material with limited mass, PTFE fabric roofs are acoustically relatively transparent, but provide a degree of absorption and noise attenuation. The inclusion of an insulted layer greatly enhances the acoustic attention of a tensile roof, particularly for mid to high frequency noise sources. This is particularly helpful for lessening the ringing reverberant in din that can affect courtyard and atrium environments. PTFE coated glass roofs are extremely low in maintenance due to the cleaning action of rain on the Teflon outer layer. Typically, cleaning is recommended every 2-5 years, depending on the location of the structure and its exposure to environmental pollution. The fabric is sufficiently strong to support a mans weight on its surface, so cleaning simply requires the incorporation of man-safe systems to access the roof surface. Cleaning us usually by means of jet-washers, soft brushes and water with a mild detergent. PTFE roofs do not need to be cleaned internally. Single skin PTFE roofs typically weigh 1.5kg per m2, and thermal sandwich roofs typically weigh 3.5kg per m2. 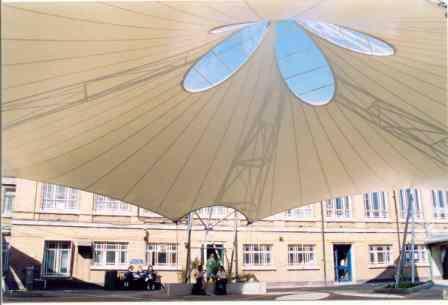 Tensile membranes can be manufactured to virtually any size and shape up to 1600m2 in a single panel. The membrane is made up from seam welded sections which are laser-cut into precise patterns. PTFE fabric is usually seamed at widths of 1.5m to 2.5m, with virtually no limit in length. Spans exceeding 60m are achievable, although rare, and potentially requiring reinforcement with structural cables. Fabric panels are pre-assembled in controlled factory conditions and packed for deployment in situ. A 200m2 panel will typically weigh approximately 300kg, and may be lifted into position by a modest crane. We are happy to warranty out system as required. The maximum warranty we have offered to date is 12 years. We generally advise that nay warranty should be back to back with a maintenance agreement to ensure that structural connections, moving parts and points of high structural loading are well maintained.